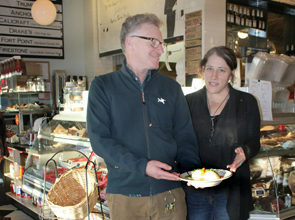 Maverick deli owners ride into Berkeley with a burr in their kreplach – J. If you ever run into a deli owner on the street, don’t tell him that his chicken soup and matzah balls aren’t as good as your grandma used to make. Don’t give him your mom’s recipe for challah; he already has two dozen from other patrons. And certainly don’t tell him he doesn’t know how to make kugel the “right” way (is there a right way?). Any such statements could send him or her over the edge. What-ever. I’m just looking for good deli, be it old school (Brent’s in the San Fernando Valley, the Stage in West Bloomfield, Mich., Jack’s in Cleveland) or new (Wise Sons pop-up deli in San Francisco). I don’t care what label you put on it, and I don’t particularly care what frou-frou ingredients you put into the food, as long as it tastes awesome. For the panelists, the event was part therapy session, part bragging and part kvetching. Much kvetching. About how difficult it is to get local ingredients, to find and afford quality, hormone-free cuts of meat and to deal continually with patrons whose minds are fixated on deli dreamlands of the past. 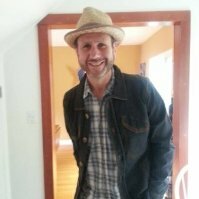 Noah Bernamoff, who runs the 2-year-old Mile End Deli in Brooklyn, N.Y. — famous for handcrafted Montreal-style smoked brisket sandwiches — outlined five reasons why “on any given day, we could be putting out our best meat [sandwich],” but the very next day, maybe it could be the worst. It comes down to the meat supplier, the quality of the cut, how the different parts get flavored as they get cured, smoked and steamed, and how it is sliced. A new-wave deli might even run out of meat (or something else) on any given day. “You’re out of pastrami? !” a customer might bellow. Or: “Hey, this isn’t as good as people say!” But that’s the way it goes at a small operation. Seems as if many patrons don’t understand these things, causing Bernamoff and his fellow panelists/deli owners much angst. They all shook their heads in agreement as Gordon related the tale of a woman who told him his chicken soup feel far short of her grandma’s. Then again, you can’t discount nostalgia. By my calculations, deli is 45 percent nostalgia, 80 percent taste, 25 percent ambience, 15 percent smell and 10 percent free pickles on the table. That adds up to 175 percent, and maybe that’s why the math for a universally ideal deli is impossible. Among the 150 or so people at the May 19 event, I think I was one of the few who has eaten at all of the delis represented on the panel: Saul’s in Berkeley, Mile End, Kenny & Zuke’s and Wise Sons. Mile End’s smoked meat sandwich was so amazing I’d have to name that deli No. 1, but for delicate(essen) reasons, I’ll refrain from naming a No. 2. All night, the panelists threw around terms such as sustainable, locally sourced, seasonal, artisanal, grass-fed and charcuterie. They discussed menu size and sandwich size. They ripped kosher meat, often from places like Uruguay, as being a joke both ethically and in terms of taste. And a few said there’s no such thing as a free pickle anymore. Andy Altman-Ohr is a j. copy editor. Reach him at andy@jweekly.com.